Following the release of Viira for iOS, our team has put together some incremental productivity improvements to the Viira iOS app. The updates are available as part of version 5.2 and are available for download from iTunes. You can download the latest version of Viira for iOS from iTunes. Viira For iPhone And iPad Now Available! We are all very excited and proud to announce the availability of Viira for iOS! Available for both iPhone and iPad (minimum iOS 8 required), Viira for iOS comes fully-loaded with capabilities that will help you stay organized and get things done. Behind the clean, streamlined interface you will find a powerful productivity toolset that brings all necessary building blocks to implement and effective and efficient GTD system. 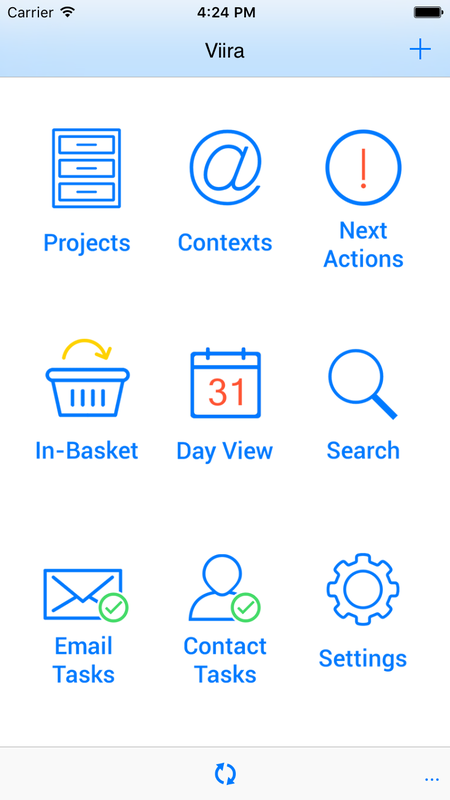 From Viira’s signature dashboard to projects, contexts, day view, next actions, in-basket to email tasks, contact tasks and rich reminders, we have strived to put everything that you need to stay on top of your commitments at your fingertips. Just like all Viira apps, Viira for iOS stays in sync with all your other Viira apps using Viira’s efficient and robust Cloud Sync service. Your personal organization system is always at your fingertips no matter if you are at home, in the office or on the go! We are also working on an OS X and Windows 10 apps which will become available, in this order, over the coming months. Projects. Organize, order and prioritize your tasks towards a common objective or purpose. Contexts. You can tag or file a task in as many contexts as needed. Day View. View your day’s commitments and appointments at a glance. Next Actions. 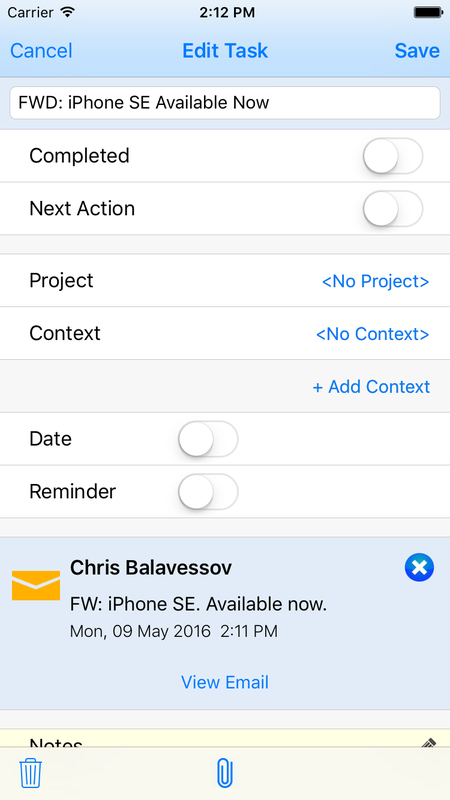 Next actions help you focus on your high-priority, immediately actionable tasks. Marking a task as a next action will make it appear at the top of any list the task belongs in. In-Basket. 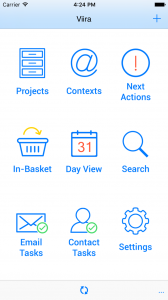 Perfect for the collection phase of GTD, the In-Basket allows you to quickly add tasks for further classification in your GTD system at a later point. Email Tasks. A powerful capability offered by few apps, email tasks allow you to add an email to a task without leaving the app. 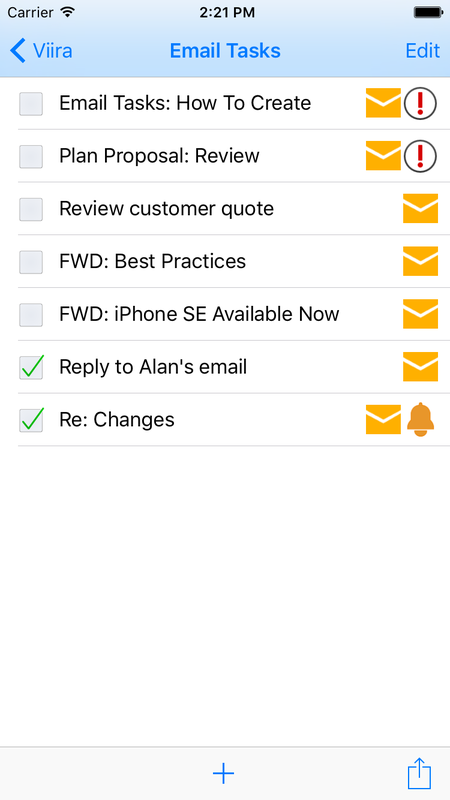 All your email tasks are available from the Email Tasks view to help you organize and stay on top of your email communications. Contact Tasks. 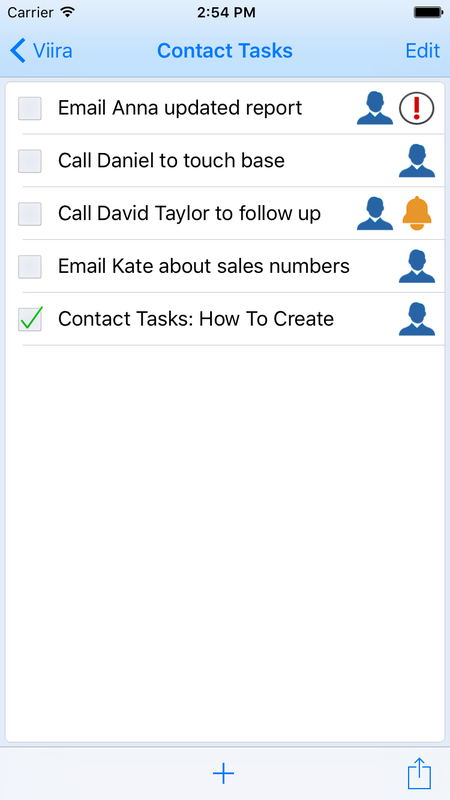 Add a touch of CRM to your GTD system! Organize your communications and commitments with your contacts by linking a contact to any task. Reminders. 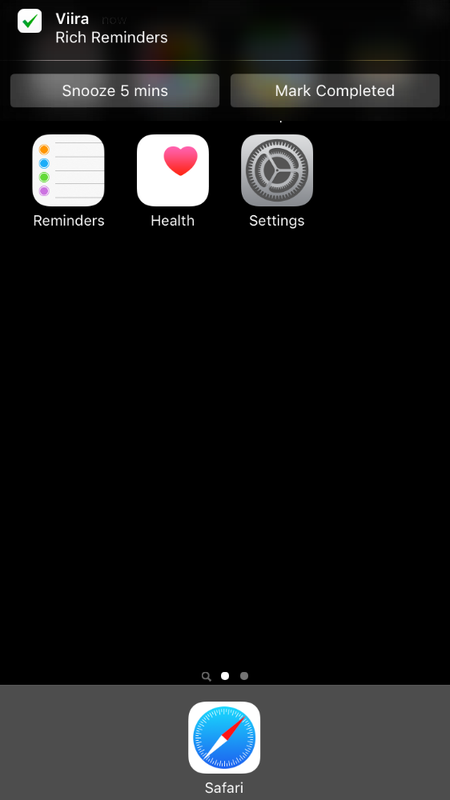 Reminders display in the Notifications area of your iPhone or iPad with convenient shortcut actions to Snooze or Mark As Completed. Drag-And-Drop Reordering . 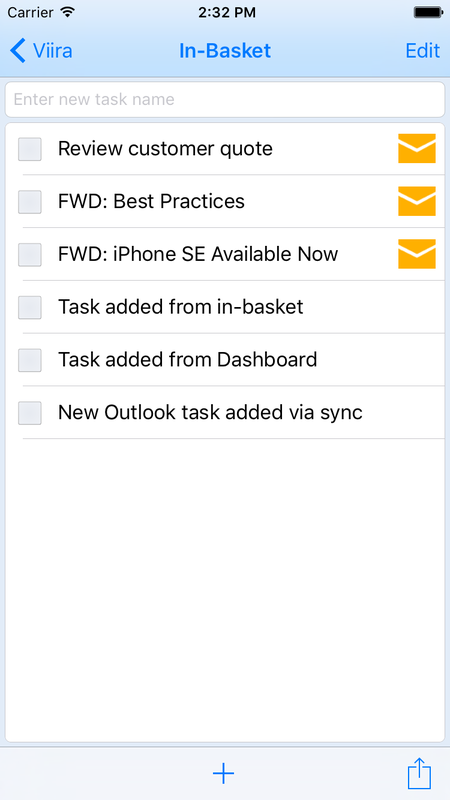 You can change the task order in any task list quickly and easily via drag-and-drop. Calendar integration. 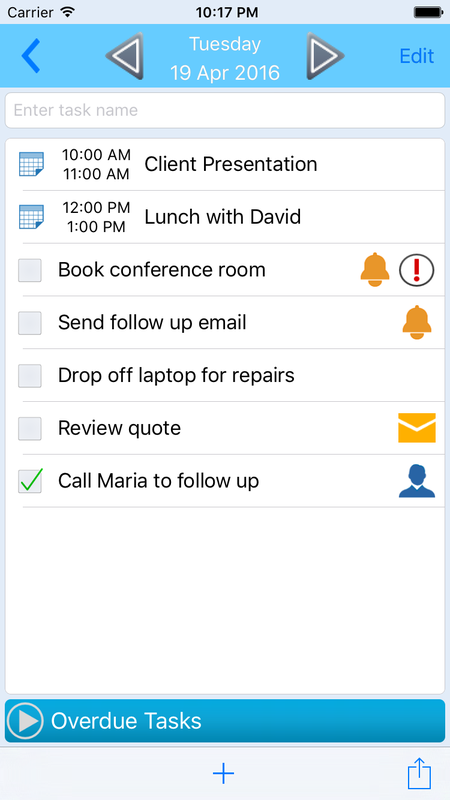 Viira’s Day View integrates with your device’s calendar and displays all your appointments for a given day. Overdue tasks. Unfinished tasks from previous days will appear in the Overdue Tasks area of your Day View to make sure nothing ’slips through the cracks’. Quick Add. All major views have a Quick Add field that lets you enter tasks quickly one after the other. Calendar Integration. 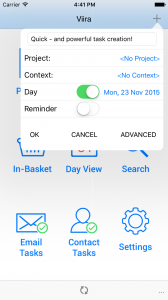 Viira integrates with the Calendar on your device to display your day’s events and appointments in the Day View. Hide Completed. An option to hide completed tasks helps you focus on what remains to be done. Automatic sorting. Completed tasks get automatically moved to the bottom of any task list whereas next actions get moved to the top. Just a quick note to let you know that the Viira Cloud Sync service to be temporarily unavailable starting at 12:00am on Monday, Apr 18th for a period of 30 to 45 mins. During this time we will be performing some server maintenance to increase processing bandwith as well as add support for the Viira for iOS launch. 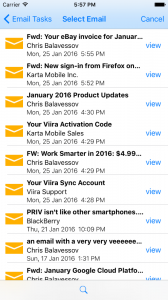 Optimized Email Retrieval: For those of you who create email tasks frequently Viira now caches your most recent Inbox email summary so that is is presented to you faster the next time you want to add an email attachment to a task. We have also added a number of other small usability and UI improvements throughout the app. For those of you on the beta testers list you will be receiving automated notification via TestFlight. 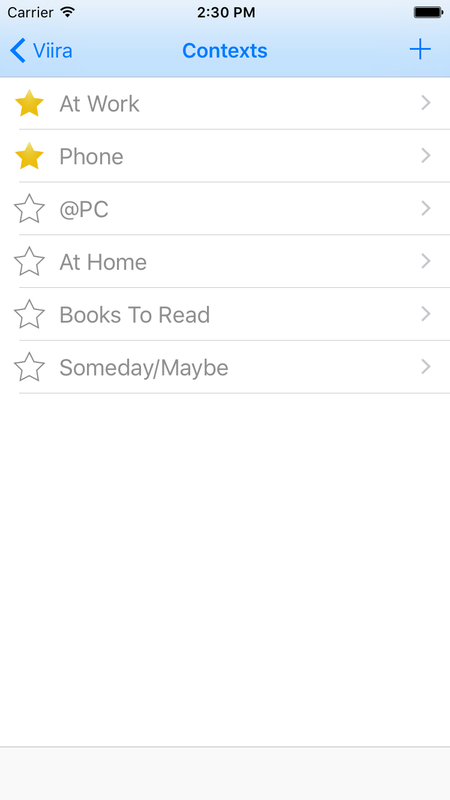 The Viira iOS app is now available for public beta testing! 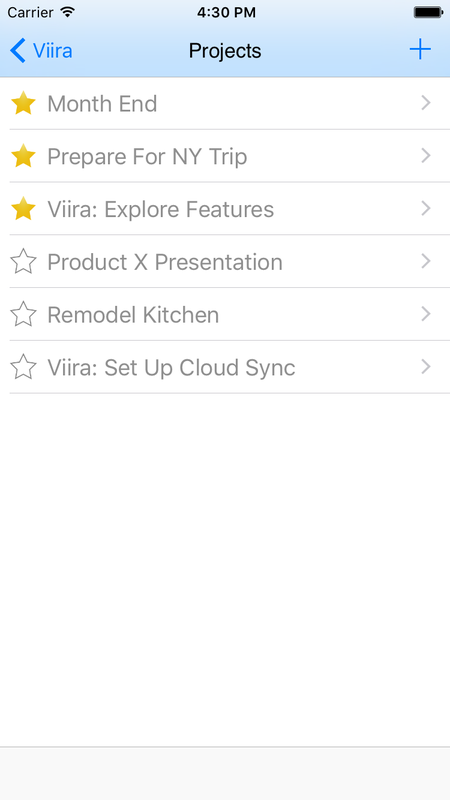 Like all other apps Viira for iOS is connected to the cloud and can sync with all other Viira apps via the Viira Cloud Sync service. 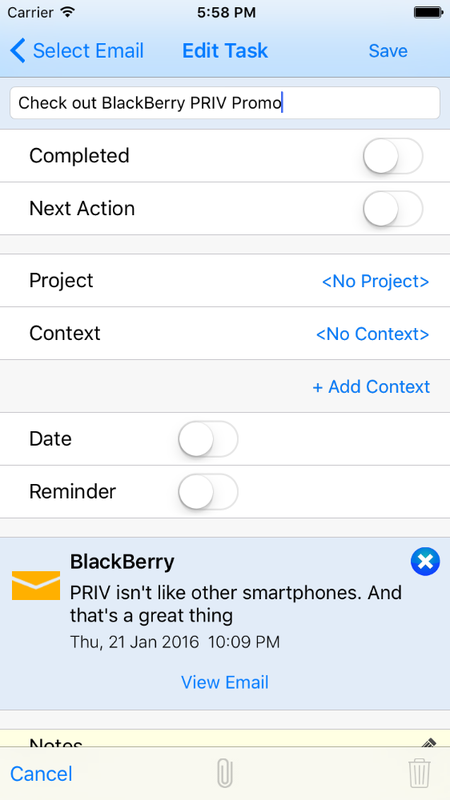 The Viira for iOS offers the same experience, workflow and core feature set as Viira for Android and Viira for BlackBerry - this is intentional. In addition to what is already familiar to many of you we have introduced a few exciting new capabilities that our team has been able to make possible on iOS. 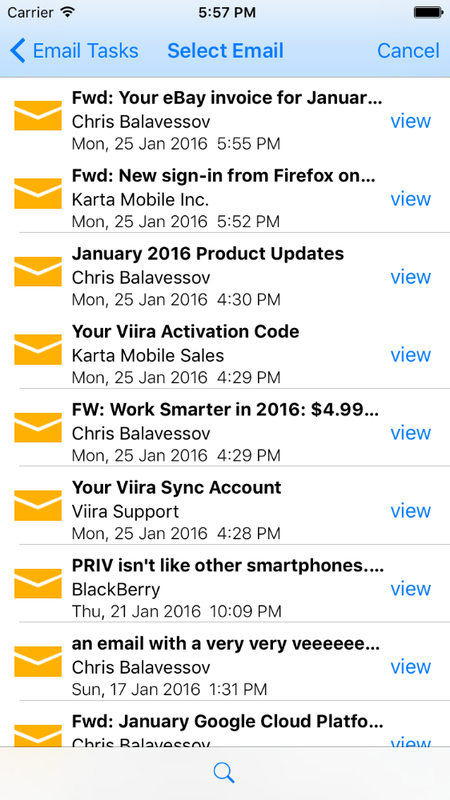 Yes, you can create email tasks directly from Viira on your iOS device! 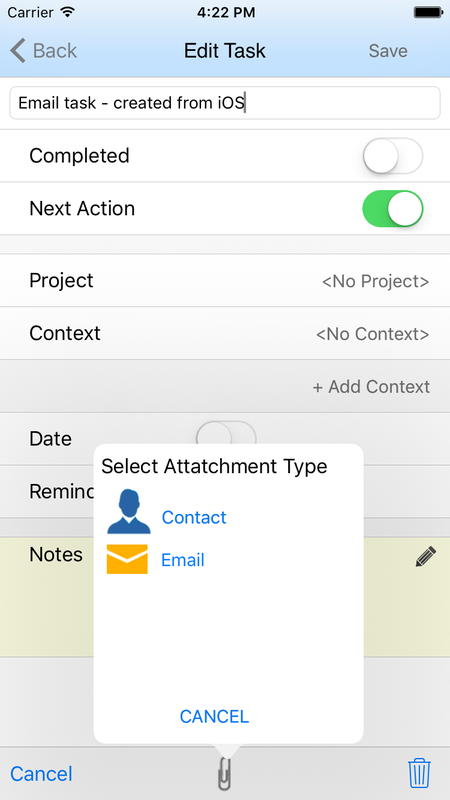 Email task creation is available from the Email Tasks view as well as by tapping the Attachment button when opening a task for edit. 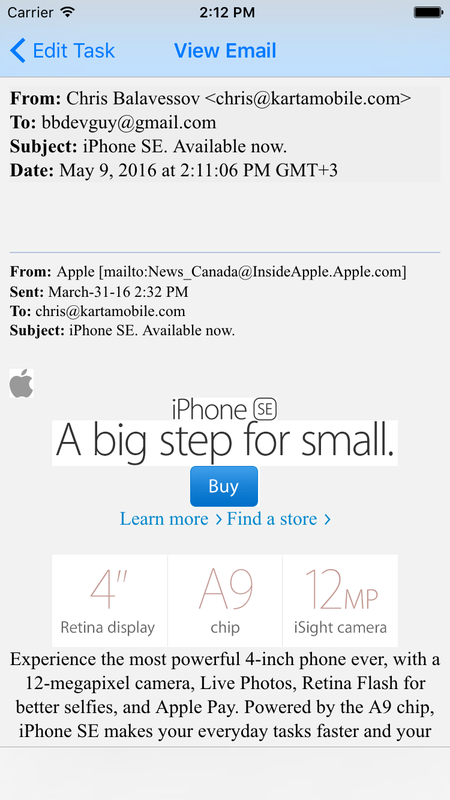 Under the hood, Viira retrieves your email messages directly from your mail server using IMAP. To help you set up email access quickly we have pre-loaded the default mailserver configurations for popular email services such as GMail, Outlook.com, Hotmail.com, Yahoo! etc. 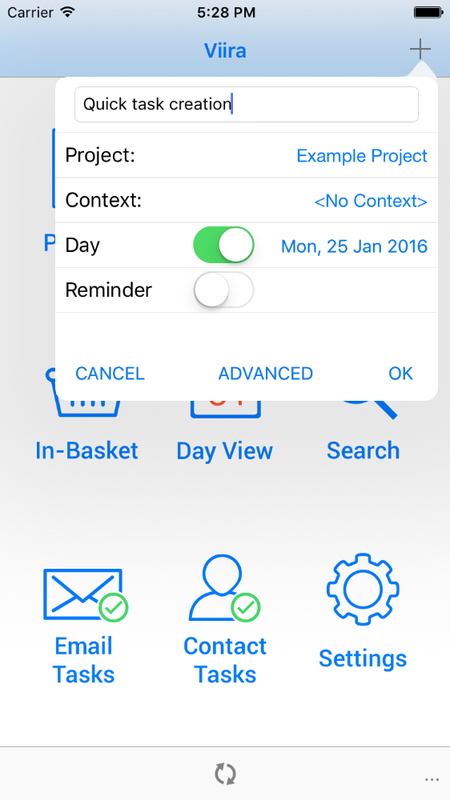 We have harnessed the power of iOS to give you a quick and intuitive way to reorder tasks within any task list, be it project, context, day view, next actions or the in-basket. 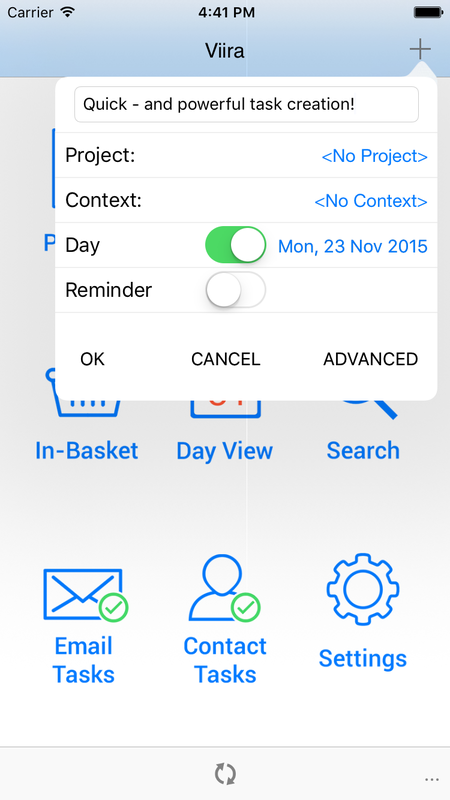 Simply select Edit and reorder the tasks as you see fit, for example to reflect priority or completion order. You can add tasks quickly from the Viira dashboard. The Quick Add panel gives you the option to assign a project, context, date or even reminder to a new task - directly from the main screen, in one step! 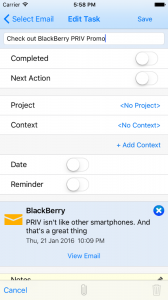 Viira’s task reminders integrate with the iOS native notifications making it easy to open the task containing the reminder or perform quick actions such as Snooze or Mark Completed. To join the Viira for iOS beta program please send us an email at support@kartamobile.com and we will send you a TestFlight invite as soon as we have test slots available.